English novelist David Mitchell has become known for his multithreaded narratives just as much as his particular, highly evocative and impressively poised prose style. His acknowledged masterpiece (and Booker Prize finalist) Cloud Atlas interwove stories from various periods in the past, present, and future into a remarkable, engrossing, moving whole while retaining each thread’s particular genre and voice, be it one of contemporary comedy, thriller intrigue, or dystopian paranoia. The book was widely admired even before the Wachowskis and Tom Tykwer adapted it into a sprawling and often tremendous (if flawed) motion picture. The Thousand Autumns of Jacob De Zoet was not Cloud Atlas‘s follow-up; the semi-autobiographical Black Swan Green was, which although I haven’t read it, I’ve heard tell it’s of lesser quality, although it does directly tackle Mitchell’s lifelong habit of stammering (which has affected his literary voice in fascinating ways). But De Zoet feels like a conscious decision to take a different narrative direction from the dazzling nested-egg construction of Cloud Atlas. If it’s labelled a reaction novel, a purposeful redirection, that’s not to dimish its own laudable qualities. 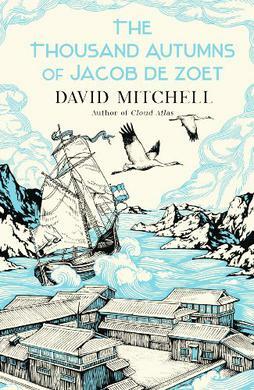 The Thousand Autumns of Jacob De Zoet is a historical novel, set at the turn of the 19th century in and around the Dutch trading post of Dejima, which sat on an artificial island in the bay of Nagasaki, Japan and was the sole point of contact between Europe and closed Sakoku-era Japan for centuries during the Tokugawa Shogunate. In (over-)reaction to a rebellion against the Shogunate involving Christian Japanese converts under the influence of Spanish and Portuguese Catholic missionaries, all ports and indeed the country as a whole was declared off-limits to all non-Japanese on the pain of death. Only Dejima, staffed by no more than a couple dozen Dutchmen and their slaves at any given time, was permitted to continue operations, and the traders were confined to the island at all times, with very rare exceptions. The titular character is a devout, duty-bound clerk who arrives on Dejima (with a smuggled-in family prayer psalter; all Christian objects are strictly forbidden in Japan at this time) as the former corrupt side-trading administrator is shipped off in chains. But the expected cleaning of house may not be all that Jacob expects, and will demand from him moral sacrifices that he cannot countenance. In between the political intrigues of the inter-Dutch relations on Dejima, Jacob befriends Ogawa, a Japanese interpreter of the Dutch language, and finds a prickly ally in Dr. Marinus, an Enlightenment-savvy physician who also instructs curious Japanese pupils in Western medical practices. One of Marinus’s students, a facially-scarred midwife named Orito Aibagawa, sparks a romantic fascination in De Zoet. Fatefully, he never acts upon his fondness for her, and when her father’s death leaves her family deep in debt, she is given up to spend her days in a mysterious mountain temple whose gradually-revealed practices fall between ominous and downright evil. Ogawa comes into possession on a damning scroll containing evidence of the temple’s horrors, and De Zoet must find a way to act upon it while also dealing with the arrival of a British warship with forceful intentions when it comes to Japan’s isolationist foreign policy. Although De Zoet is, unlike Cloud Atlas and some of his other earlier work, a contained narrative with a relatively small number of characters, it sprawls into wider detail of not only Japan but also of the 18th Century milieu from whence the Europeans came. If one must compare its tone to Cloud Atlas, much of the Dutch-centric portions resemble the contrast of the gentlemanly self-possession and lusty ribaldry at the edge of the world that characterized the Pacific Journals of Adam Ewing section (a seaman character from the epistolary Ewing section appears as a younger man in a cameo at the end of De Zoet, as a matter of fact). The portrayal of the Japan of this period, meanwhile, features elements of busy urban complexity and samurai-espionage tension (Mitchell lived in Japan for many years and researched the period in question thoroughly for the novel; indeed, he was inspired to write the book by an accidental visit to the in-progress erection of a Dejima historic site in Nagasaki while travelling there). But there are also frequent descriptive instances that seek to approximate a zen-like serenity: portentous political conversations in the Magistrate’s palace feature dialogue interspersed with buzzing insects, dripping water, Go pieces shifting across a game board, and other telling, poetic environmental details. De Zoet may seem narratively straightforward compared to Mitchell’s more challenging non-linearly-arranged work, but its plotting is not so clear-cut as it might seem. After spending much of the novel’s first “act” establishing the nature of Dejima and its cast of characters, Mitchell jerks us away from the Dutch trade-island to Orito’s captivity on Mount Shiranui, to her former suitor Ogawa’s plans to free her, and to the Magistrate’s meetings with the powerful abbot of the temple, Enomoto. He later jumps onto the deck of the British ship as it approaches Nagasaki. These shifts in perspective are jarring at first, but the quick adjustment that the reader makes to them testifies to the potency of Mitchell’s narrative and prose capabilities. The Thousand Autumns of Jacob De Zoet, though it occupies a certain space in historical time and narrates contentious temporal conflicts in that space, finally leads into a impression of continuous time, a sensation of amorphous liminality often referred to as “eternity”. This feeling of eternality aligns it with Cloud Atlas, whose occasional larger, more profound thematic turns leaned towards a similar expression of interconnection through the ages. This book’s breed of eternality is of a most Japanese character, as the title emphasizes: Japan is sometimes referred to as the Land of a Thousand Autumns, as a character tells Jacob at one point. The stretched, elegiac expression of the passage of time evident in that moniker is, more than anything else, the essence of David Mitchell’s striking and excellent take on the historical novel.